Frederick Douglass in Washington, D.C.: The Lion of Anacostia | The first book to explore Frederick Douglass's years in Washington, DC. Published by the History Press in October 2012. 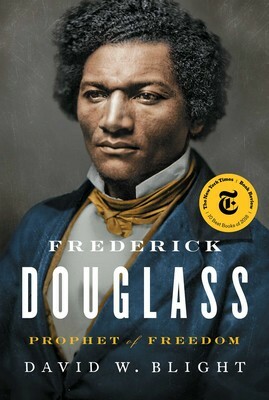 John Muller, author of “Frederick Douglass in Washington, D.C.: The Lion of Anacostia,” will present on the topic of Frederick Douglass’s little-known history in Western Maryland at 11:30 a.m. and at 2 p.m. on Saturday, April 27, at the Newcomer House on the Antietam National Battlefield near Sharpsburg. Muller’s discussion will kick off The Heart of the Civil War Heritage Area’s 2019 Newcomer House Porch Program Series. His lecture described visits made by Frederick Douglass, the famous escaped slave, orator, and intellectual, to Frostburg and Cumberland, Md. in the 1800’s. Muller also discussed friends and political acquaintances of Douglass’ from Western Maryland. One such associate, Lloyd Lowndes of Cumberland, later became governor of Maryland from 1896 to 1900 and was honored on FSU’s campus with the naming of Lowndes Hall. Born in 1818 in Talbot County, Md., Frederick Douglass escaped slavery in 183. He became famous in 1845 with the publication of his memoir, “Narrative of the Life of Frederick Douglass, an American Slave.” The autobiography is considered one of the most influential pieces of literature to fuel the abolitionist movement of the 19th century in the United States. In his lifetime, Douglass became the first African American nominated for the Vice President of the United States on the Equal Rights Party ticket. “When Frederick Douglass Came To Town,” April 14, 2019. Cassie Conklin. The Bottom Line.